While new ant species are usually discovered in surveys involving researchers searching through leaf litter, it turns out that sifting through the stomach contents of insect-eating frogs might prove no less effective, especially when it comes to rare species. Such is the case of a new species of rarely collected long-toothed ant, discovered in the belly of a Little Devil poison frog in Ecuador. The international team of Drs Christian Rabeling and Jeffrey Sosa-Calvo, both affiliated with University of Rochester, USA, Lauren A. O’Connell, Harvard University, USA, Luis A. Coloma, Fundación Otonga and Universidad Regional Amazónica Ikiam, Ecuador, and Fernando Fernández, Universidad Nacional de Colombia, have their study published in the open access journal ZooKeys. 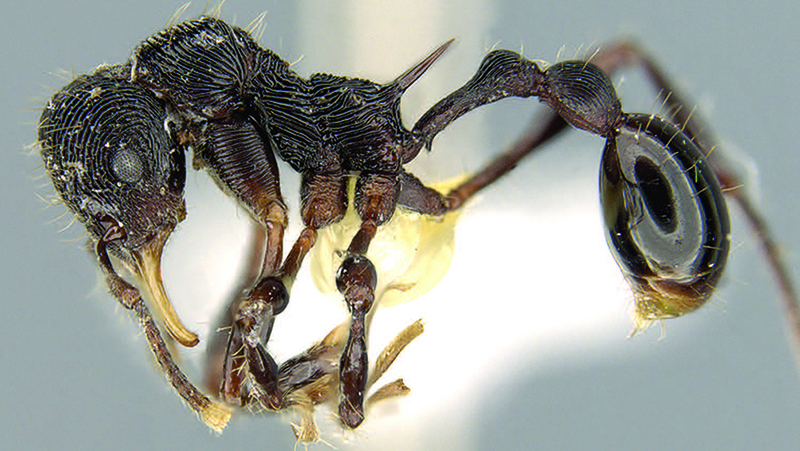 The new ant species, named Lenomyrmex hoelldobleri after renowned myrmecologist Bert Hölldobler on the occasion of his 80th birthday, was described based on a single individual – a female worker, recovered from a Little Devil poison frog. It is the seventh known species in this rarely collected Neotropical genus. Similarly to its relatives within the group, this ant amazes with its slender and elongate mouthpart, yet it is larger than all of them. The remarkable jaws speak of specialised predatory habits, however, so far, nothing is known about these ants’ feeding behavior. The amphibian, whose diet majorly consists of ants, was collected from the Ecuadorian region Choco, which, unfortunately, despite being one of the most biologically diverse areas in the world with exceptionally high levels of endemism, is also one of Earth’s most threatened areas.